Razer, the world leader in high performance gaming hardware, is proud to announce their newest gaming concept design the Project Fiona PC Gaming Tablet. 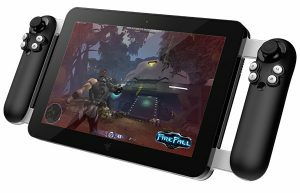 Unlike other tablets designed for general use and casual gaming, Project Fiona is a tablet concept designed to play the most popular PC games of today with an intuitive control setup for a phenomenal on-the-go gaming experience. Razer worked closely with Intel to harness the power of its third generation Intel Core i7 processor in Project Fiona. 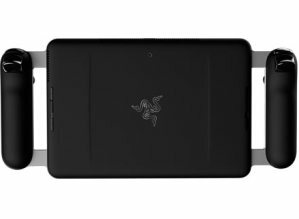 As a result, Razerâ€™s tablet is more akin to a fully functioning PC; and yet in a form factor and platform highly familiar to everybody. Instead of relying on developers to work on a suite of brand new applications for Project Fiona, many PC games today run natively on the tablet concept without the need to be ported, optimized, or developed from scratch. Moreover, Project Fiona will feature one of the most powerful processors integrated in a tablet form factor. Instead of the casual and mobile-only games that run on under-powered tablets, Project Fiona will run full-fledged PC games that have never run on a tablet form factor before until today. â€œProject Fionaâ€™s combination of high performance Intel-based gaming hardware and innovative tablet design is specifically focused for PC gamers. It will unleash the PC gamer to play their existing and future high-end games in one of the most exciting new form factors a tablet,â€ said Brad Graff, Director of Partner Marketing, Netbook & Tablet Group, Intel. Razerâ€™s multi-award winning user interface and ergonomics team have developed an all-new hybrid user interface scheme for Project Fiona. Featuring integrated dual game controllers with ultra-precise analog sticks, Project Fiona runs gamepad-enabled PC games right out of the box. Along with the game controllers, Project Fiona is also designed with ultra-precise accelerometers and a highly sensitive multi-touch screen. This provides game developers with new game experiential opportunities to develop around the hybrid game control experience offered by Project Fiona. It also ensures current-generation PC games run on the tablet concept, as well as any existing games optimized for the touchscreen interface of a tablet. Future games developed for Fiona are expected to take advantage of not just the integrated gamepad controls but also integrate core game functionality controls for the touchscreen and accelerometer-based controls. To further intensify the gaming experience with Project Fiona, Razerâ€™s integrated dual controllers deliver full force feedback, so every explosion or gun recoil can be felt in the gamerâ€™s hands. For years they have been talking about a true “Gaming Tablet” and it’s finally here. I donâ€™t know about you guys, but to me this is a gamer’s dream.